A blazing fastball and his reputation as a tough-as-nails pitcher helped Juan Marichal become a Hall of Fame player for the San Francisco Giants. Even so, collectors sometime skip over cards of the "Dominican Dandy" for other pitchers from his era. This top 10 list will help to illuminate why you shouldn't overlook Marichal in your Hall of Fame collection and which of his noteworthy baseball cards you should focus on. 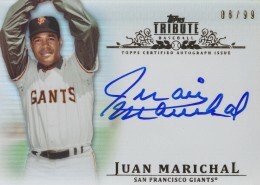 Shop for Professionally Graded Juan Marichal Cards on eBay. Juan Marichal was a notoriously resilient player who would frequently throw at batters if they were crowding the plate. In a 1965 game, Marichal threw at a few Dodger batters and when Marichal came up to bat later in the game, Dodgers catcher Johnny Roseboro threw the ball back to the pitcher and it grazed Marichal's head in the process. Juan attacked him with his bat and hit him several times in the head. 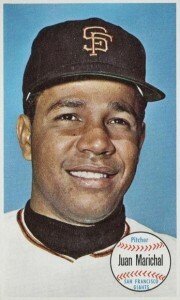 The fight and Marichal's suspension earned him a bad reputation that followed him his entire career. Despite this ugly event, Marichal's statistics demonstrate he was one of the most dominant pitchers of the 1960s. Helping that claim, Juan Marichal was a 10-time All-Star with a .631 winning percentage. Along with Sandy Koufax, he is the only post-World War II pitcher to have more than one season with 25 or more wins. While many of his top options are covered below, there are plenty of notable cards from Marichal's career that didn't make this list. His last card as a player can be found in the 1974 Topps Traded set which announced that he had been traded from the Giants to the Boston Red Sox. The following year, he briefly played for the Los Angeles Dodgers but there were no cards issued for his time with the team. Giants fans can turn their attention to 2014 Topps Heritage which features a dual autograph of Marichal and current Giants ace Madison Bumgarner. Juan Marichal's baseball card career runs the gambit from his very expensive early cards to more budget-friendly and yet still remarkable appearances toward the end of his career. In building this list, each card's value was balanced with their accessibility and overall desirability. 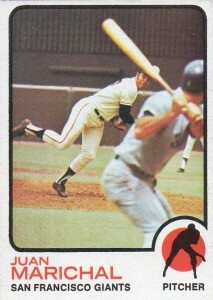 The trademark move of Marichal on the mound was his huge leg kick. This was featured on his 1972 Topps In Action card and collectors can also look to his 1974 Topps for another great example of Juan's wind-up. Although collectors have many cards to choose from highlighting Marichal's wind-up, they don't have too many featuring his follow through that often left him falling forward and nearly hitting the dirt. 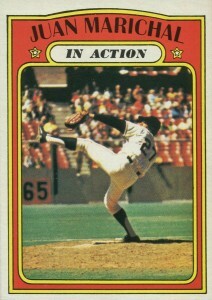 His card from 1973 Topps features an example of his follow through with a perfectly-timed photo taken from the batter's perspective. 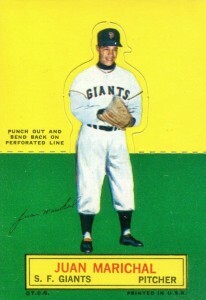 Topps tried something different in 1964 with their Giants set that, unfortunately, never really caught on. The cards, which are the size of a postcard, offered close-up portraits with a simple design and skipped the facsimile signature that was very popular at the time. The Giants set features great photography and a budget-friendly price for buyers. With four Hall of Fame pitchers on one card, this 1967 Topps subset offers some serious bang for your collecting buck! Although Marichal is often overlooked by collectors in favor of Sandy Koufax and Bob Gibson because of their World Series success, it is actually Marichal who won more games in the 1960s. 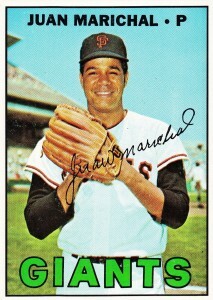 The 1967 Topps Juan Marichal card is one of his most beautifully-composed collecting choices. The green "GIANTS" blends nicely with the grass in the background as does his facsimile signature running across his chest on his white jersey. By virtue of the card being included toward the end of the 1967 set, his card is valued higher than some of his earlier-issued base cards. 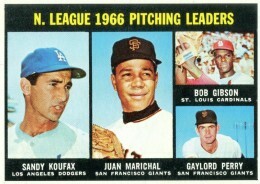 If you asked collectors to picture Juan Marichal in their mind, chances are good it would be from his 1965 Topps card. The aqua-colored back highlights Marichal's no-hitter that he pitched the previous season against the Houston Colt .45s. Marichal is frequently included on the checklist of newer high-end sets and he appears in both the 2015 Topps Tier One and Tribute releases. With quite a few autographs to choose from, buyers will certainly want to zero in on a nice on-card autograph with a pleasant design and his 2013 Topps Tribute card fits the bill. Collectors with a little more to spend can find parallel versions of the autograph with limited quantities. For Marichal collectors who can't afford to spring for his rookie card, take a look at Juan's 1962 Topps card as a nice alternative. You can find copies for about half the price of of his Topps debut. The reverse side of the card reminds us that Marichal never had a losing record in any professional league to that point and that would continue to be true through the 1971 season. Along with the 1964 Giants set, Topps also tried something new and issued a Stand-ups set which harkened back to National Chicle's Batter Up set from 30 years earlier. The top half of these unnumbered, blank-back cards could fold down, leaving the player standing on the green field. Folding the card, of course, hurts the value and Juan's card is a short-print, making this his most valuable card next to his rookie. 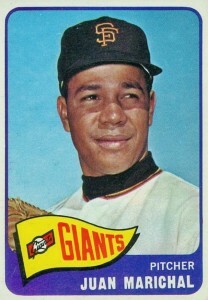 Although Juan Marichal was an impressive 6-2 over 11 starts in his rookie year, Topps didn't bestow the All-Star Rookie Cup on his 1961 Topps debut. 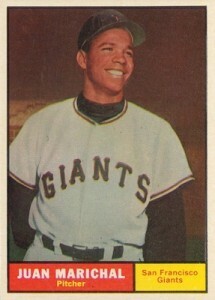 Even still, the card featuring his wide bright smile has proven to be the most valuable of all the rookies from the 1961 set. I have a bunch of cards that me and my dad collected. I would like some input. I don’t even know how to go about doing this. 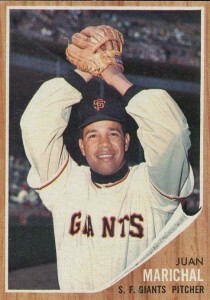 i have a juan marichal puget sound bank rookie card 1962.contact me!